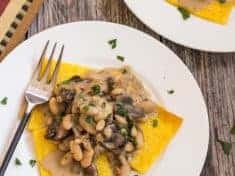 Drizzle cooked corn polenta with olive oil and bake until almost crisp, then top the golden little squares with something really delicious like a creamy vegan mushroom sauce and tender-smooth protein-rich white beans, and you’ve got this golden polenta with cannellini beans and mushroom sage gravy! The veggie gravy features sautéed meaty umami mushrooms, sweet onions, garlic and gently pungent sage. To that, stir in vegetable broth, creamy sweet sesame tahini and the cannellini beans. Ta-da–you’ve made an aromatic vegan gravy, a savory sauce that’s as delicious with mashed potatoes as it is with polenta! Last Thanksgiving my niece make the mushroom gravy to go with our vegan mashed potatoes. First cook the polenta using one of the methods below, Instant Pot, microwave, stove-top or oven. Once cooked, the hot polenta cornmeal mush is spread quite thinly in the pan. As soon as the polenta is firm and set, you can cut it into the squares. When you are ready to serve this dish, brush the polenta squares with olive oil and bake in a hot oven until golden around the edges. While the polenta bakes, make the mushroom gravy with sesame tahini and beans. The rich seasoned gravy with crisped baked polenta squares makes an amazingly simple vegan-happy feast! Some of these links are affiliate links. When you purchase products via my links, it doesn’t cost you anything and I earn a tiny commission. Nutritional yeast adds vegan cheesy nutty taste. If you wish, stir in 1/4 cup grated Parmesan cheese instead. Make sure to buy whole grain polenta, not the instant kind. Look for both polenta cornmeal and nutritional yeast in bulk bins at natural food stores. Or you can order them online through my highlighted Amazon links. Vegetable broth: Vegetable broth cubes or powder are great pantry items to keep on hand. Really, when a recipe calls for vegetable broth—it’s what I use. 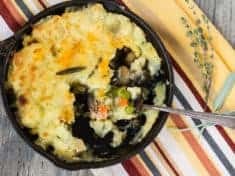 This Vegan Shepherd’s Pie features a similar mushroom gravy without the cannellini beans. Have you always avoided cooking polenta from scratch? The second you find out it has to be cooked and stirred for 45 minutes, do you turn the page? Yeah, me too. With an Instant Pot pressure cooker or microwave oven, making polenta is quick and easy! In like 15 minutes! **** Whichever way you cook your polenta, before it cools, pour the soft hot mush into the oiled baking sheet and spread into an even layer. It will be a bit less than ¼-inch thick. Cover and chill until firm. A pan of cooked polenta like this will keep for several days refrigerated. For Instant Pot pressure cooked polenta: Put the vegetable broth and water, polenta, olive oil, and salt in the Instant Pot. Do not stir. Lock lid. Sent the top Vent to seal. Cook on Porridge setting with time adjusted to 7 minutes. Natural pressure release for 10 minutes, then vent to release the pressure completely. For microwave polenta: Combine the water, vegetable broth, salt, polenta and the olive oil in a microwave-proof bowl. Cover and cook on highest power for five minutes. Stir, cover again and cook for another five minutes. Stir in the nutritional yeast, cover and cook for three more minutes. For stovetop polenta: Bring 2 cups water and 2 cups veggie broth to a boil in a medium-size heavy sauce pan over high heat. Add the salt and olive oil. Slowly pour cornmeal into the hot liquid, stirring with a wire whisk or wooden spoon. In 2 to 3 minutes, when the polenta begins to thicken, reduce heat to low. Cook for at least 45 minutes, giving it a stir every 5 minutes or so. When it is very thick, stir in the nutritional yeast. Here’s a recipe for oven roasted polenta. 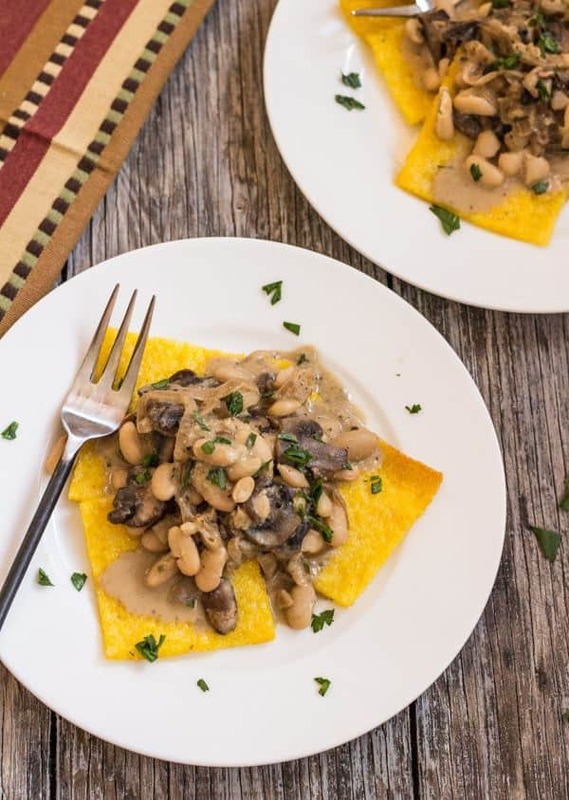 For a plated appetizer, top one warm polenta square with about a tablespoon of the gravy-sauced beans and mushrooms. Serve with a sprinkle of parsley. 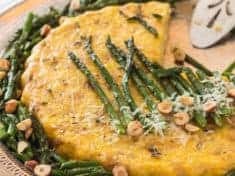 You might also enjoy this Polenta Cauliflower Torta with Roasted Asparagus. And this Arugula Cashew Pesto with bite-size polenta squares. Creamy vegan sage and mushroom gravy can be a delicious starter course too! Top just one warm polenta square with a spoonful of the mushroom and bean gravy. Sprinkle with parsley. Times here are for polenta cooked in the Instant Pot pressure cooker or microwave oven. Very lightly oil a 12 x 16-inch baking sheet. 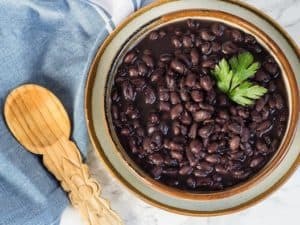 Combine the water, vegetable broth, salt, polenta and the olive oil in a cooking container, either a pressure cooker, microwave-safe bowl, or heavy soup pot. To cook in an Instant Pot pressure cooker: Put the vegetable broth and water, polenta, olive oil, and salt in the Instant Pot. Do not stir. Lock lid. Sent the top Vent to seal. Cook on Porridge setting with time adjusted to 7 minutes. Natural pressure release for 10 minutes, then vent to release the pressure completely. To cook in microwave oven: Cover and cook on highest power for five minutes. Stir, cover again and cook for another five minutes. Stir in the nutritional yeast, cover and cook for three more minutes. To cook stovetop: Bring 2 cups water and 2 cups vegetable broth to a boil in a medium-size heavy sauce pan over high heat. Add the salt and olive oil. Slowly pour cornmeal into the hot liquid, stirring with a wire whisk or wooden spoon. In 2 to 3 minutes, when the polenta begins to thicken, reduce heat to low. Cook for at least 45 minutes, giving it a stir every 5 minutes or so. When it is very thick, stir in the nutritional yeast. Quickly pour the soft polenta into the prepared baking sheet and spread into an even layer before it cools. It will be a bit less than ¼-inch thick. Cover and chill until firm. To crisp the polenta: Preheat oven to 450 °F. 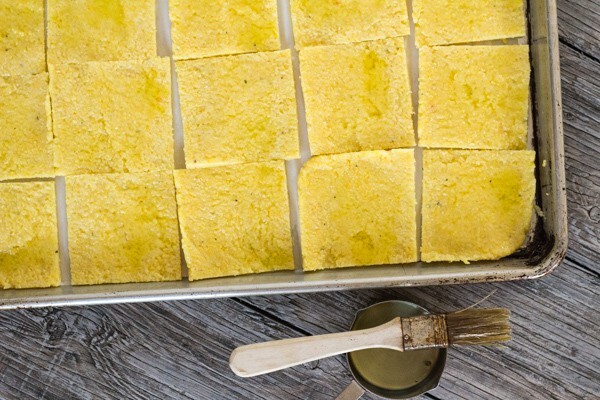 Turn the polenta out onto a cutting board and cut into 20 portions, approximately 3-inch square. Line the baking sheet with parchment paper. Arrange the cut squares on the parchment and brush them lightly with olive oil. Bake 25 to 30 minutes, until you see a hint of golden brown around the thinnest edges. Remove from the oven but keep warm. Heat the olive oil in a large skillet. Sauté the onions and mushrooms over medium-high heat, until the onions and mushrooms are just taking on color and the liquid has evaporated. Add the garlic and cook another minute. Lower the heat to medium and stir in the arrowroot or flour, stirring to coat the mushrooms and onions. Add the vegetable broth, stirring continuously for about a minute, until you see the sauce thicken a wee bit. 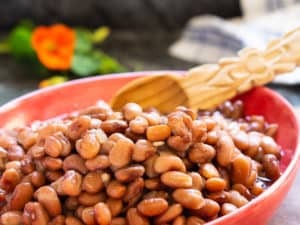 Add the tahini, beans, sage, and salt. (see note) Stir another minute or so. Resist the impulse to cook it longer as tahini sauces thicken on their own, with time. If needed, stir in 1/4 cup more vegetable broth. Season with 20 grinds of pepper and more salt, to taste. 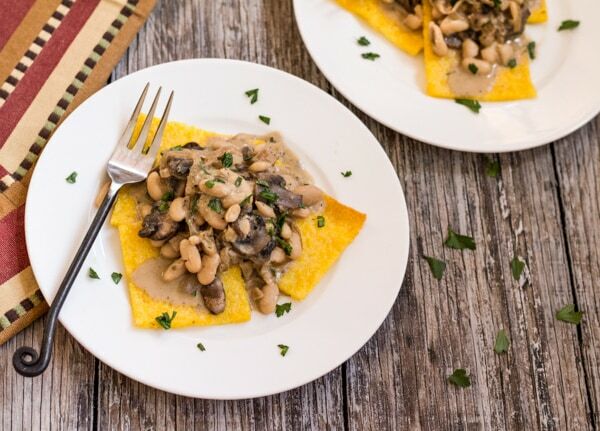 To serve: Arrange 3 polenta squares on each plate and top with a generous spoonful of the mushroom and bean gravy. Sprinkle with parsley. For vegetable broth I use powder or cubes diluted in hot water. Sage: You can substitute 2 teaspoons poultry seasoning or rubbed sage for the fresh sage. This recipe was originally posted in October 2016.